Flute!? In a Christmas song? That can only mean Jethro Tull! This is one many of you may not know, and we here at Bigbluebullfrog.com think that’s awesome. This is one that’s been in the family for years, but doesn’t really get much recognition outside our family nucleus. Why? Who knows? It is superior to Jethro Tull’s “A Christmas Song” from early in their career in 1968; although that song was on this list at one point too. Who would have thought Jethro Tull would be so into Christmas? Musically this one starts with some light flute, drums, and the occasional wood blockish sound before progressing into Ian Anderson’s singing and some light touches of electric guitar. The first sounds return between verses, and the guitar sticks around in the back ground for most of the rest of the song. The guitar matches up with the flute on certain sections, or they will play off of each other which is a pretty impressive technique to hear. The keyboards are subtle throughout the song, but you just have to listen for them to discover that they are the backbone for the song. The bass is the same way hiding underneath the other more flamboyant instruments but it too adds a good deal to this one. 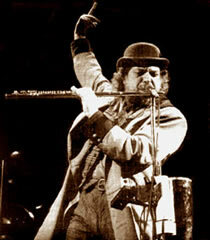 The way Jethro Tull as band arrange their music makes them a great deal of fun to listen to. When you think the song is over the drums kick back in, and when you think a verse will go one way it goes another. I know what you are saying! This is all well and good, but what is the song saying? Well my friendly Christmas Rock song reader this song is saying quite simply: Remember. The song follows an old man who is calling his children home to him for Christmas. Throughout the story of the old man Anderson calls subtle attention to other parts of the world and other people. Unlike John Lennon or Band Aid who beat you over the head with their messages, Anderson says simply, “Hope everybody’s dancing to their own drum this fine morning/ the beat of distant Africa or a Polish factory town.” In this way the listener can interpret that line as, “yeah he’s calling attention to how we in the West don’t ever think about Africa,” or you can take it as “He thinks everyone should have a fun Christmas.” Leaving room for interpretation is what makes art go from good to great. Just think about any Christopher Nolan film. What makes him a great film maker? He doesn’t tell you anything! He presents a story and you are left with taking it how you want to. I could interpret the ending of the Dark Knight, or Inception radically different than anyone else. This is what makes Jethro Tull’s “Another Christmas Song” so much better than the other songs on this list, at least lyrically. It is deep, but it’s not moralizing.